ZX Lidars has invested heavily in a new facility near Pershore, Worcestershire, where the company makes lidars for the wind industry. Here, the firm's Alex Woodward reveals the back story. The development of the ZX Lidars' Wind Lidar Production Centre was a staged process. It started with identifying a series of primary goals for the project, including the establishment a new manufacturing philosophy across the company. To understand the requirements, an initial consultation between ZX Lidars’ business leaders took place to understand the scope, timeline and budget requirements. The current state of the value stream was investigated, and any wasted activity identified to help envisage and improve the future value stream. Nevertheless, a degree of flexibility had to be incorporated during this evaluation stage as the company was in the process of creating a new product stream. Schematics of the ideal production flow were created and the proposed floor plan was laid out in the open, unfurnished factory space using temporary signage and with the proposed materials to visualise the atheistic and ergonomic layout. From here, changes were incorporated into the final design and workstations and fixed furniture committed to. The aesthetics of the facility were to be minimalistic and flexible, and hot desking solutions were also sought. Visual meeting rooms were designed and the manufacturing flow (from part assembly, through to testing and then to final assembly and testing) was created. A range of other considerations had to be taken into account at this stage. For example, action was taken to increase the levels of cleanliness as the product flows through the facility and a containment-free working environment was consequently included in the design. The design of the centre was also future-proofed by incorporating flexible design practices, for example the power and communication requirements. This adaptability of the space enables the future growth and expansion of the production facility. Finally, the 5S lean manufacturing system was introduced from the onset of the facility’s conception. As a first step toward the move to lean manufacturing, only the required materials, tooling and products were transferred to the new facility and work benches with specific tooling requirements were identified and established. Aside from budget controls normal to a project, the main challenge was the seamless transfer from the old facility to the new facility without stopping operations and customer support activities. To overcome this issue, minimum buffer stocks were strategically built to lessen the impact on the build activity during this period. A transitional move was then made with the support of our production team. This move was completed over a period of just three days and no manufacturing section was stopped for more than two hours at a given point in time. A full site preparation for an ISO Audit Transition was also necessary to ensure that the new facility and manufacturing approach met the existing quality management system (QMS). Using the existing framework for ZX Lidars’ QMS ensured the firm remained fully compliant. Once opened, the new facility has greatly enhanced the cleanliness of the manufacturing environment. It now operates a clean room policy with check points to minimise the risk of particulates entering the facility. There are three separate sectioned off zones, including a final zone where the testing and integration of Lidars is completed in a positive pressure environment to further reduce particulate ingress. Overcoats, clean room shoes and hairnets are also used to further enhance the facility’s cleanliness. Finally all cardboard- and paper-based component packaging is removed at the point of entry. The building itself also incorporates a lot of natural light and the lighting systems were carefully designed to maximise the visibility and flexibility of the facility. The Wind Lidar Production Centre has embraced the fundamental building blocks of the lean philosophy and, as a result, this ethos has become part of the wider company culture. Consequently, the new centre is a self-contained facility, adopting a clean visual approach. It embraces concepts of lean thinking and adds value at its core. This lean culture is clearly demonstrated in the layout, which was designed with flexibility at its heart. As a result, this will enable ZX Lidars to adapt, grow and introduce new products and services in the future, without the need to increase the facility’s footprint or complete another redesign of the manufacturing space. For example, dynamic point-of-use storage solutions, modular benches and build stations have been used, which allow the build sequence and the infrastructure to be readily adapted. This means one can easily change the layout of the manufacturing space to match the production needs of a new product within a couple of hours. The adaptable build process has enabled the product to flow in an improved manner, greatly reducing the waste, walk-in rates and build process times. Since the new facility came on line, the firm has realised significant reduction in build time and a matched improvement in output in new build activity. Product support has been able to double the number of units being serviced. All of this was achieved with no increase to the company’s headcount and with less than one year of manufacturing at the new facility. We expect this success to continue and grow in the years ahead. The production and product support teams, which were previously split across several areas, have combined into one functioning team. This brings a wealth of skills and knowledge into one space, and this also greatly enhances the client experience. All of the company's expertise is now available on tap thanks to the new layout. The new facility also incorporates the supply chain team and procurement teams, which brings an agility to the availability of parts used in the manufacturing process. It’s not just that the teams are working in one environment. 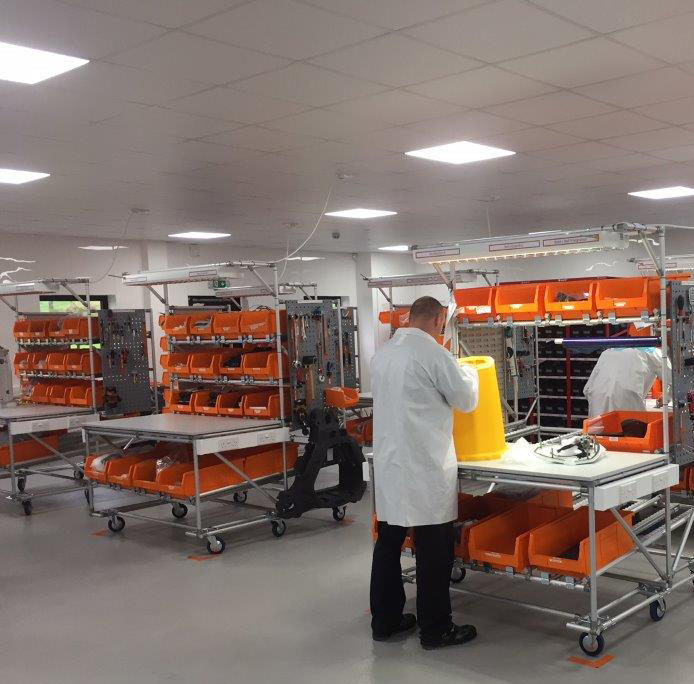 From part supply through to the build process, testing and finally packaging ready to ship, the whole manufacturing process is now located under one roof and this has allowed the company to scale up its production rates. As a result, the reduced manufacturing time for new builds has enabled the commercial teams to offer vastly improved lead times. This is thanks to the ability to increase the skill base by joining valuable team members under one roof. As a result, the company can respond to client needs in a far more timely fashion. This change programme has been instrumental in helping the firm's teams to embrace new manufacturing principles and the wider lean philosophy. For example, once the centre opened, its staff had to move from building lidar units in batches, to singular unit builds as the primary method of production. Mindset and cultural changes needed to be overcome to embrace this new way of thinking and the new production philosophy. This challenge was approached by coaching and working both with individuals and within ZX Lidars’ teams. This helped to ensure everyone understood the concept of lean thinking and the wider goals of adding value through the continuous improvement of the manufacturing environment.